I was invited to Oak + Almond in Norwalk for its Four Roses Bourbon dinner to sample some of Chef Joseph Italiano’s creative cuisine paired with one of the country’s best bourbons. Working alongside Chef Italiano for this special event was Chef Chris Vacca, who our readers know from serving one of the best burgers in Fairfield County from his food truck, Bounty. Chef Italiano has been at the helm for several months after stints at Bistro B in Westport and Bridgeport and with Chef Pat Pascarella at Bar Sugo. We began the evening with a wood oven roasted Hudson Valley quail with speck, wild mushrooms, and stewed chickpeas, paired with an Old-Fashioned. 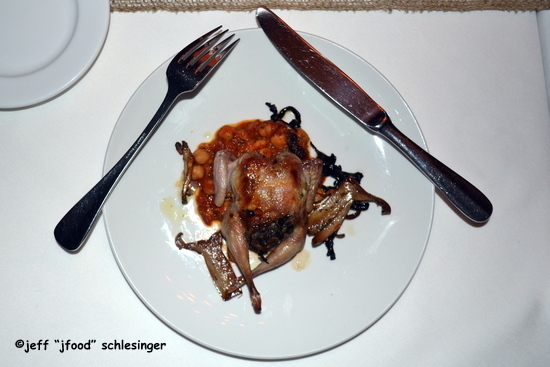 The de-boned whole quail was stuffed with a variety of sliced wild mushrooms. The bird sat atop the chickpeas and stewed tomatoes. The quail was juicy and delivered a mild flavor, not gamey. The mushrooms were wonderful, very meaty and earthy and the chickpeas and tomatoes were an interesting addition. The dish offered a variety of flavors and textures but was a little under-seasoned. 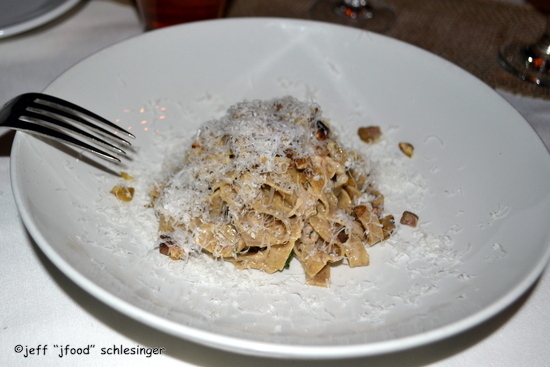 The second course consisted of whole wheat fettuccine topped with braised rabbit Sugo, chestnuts, grainy mustard, and topped with Pecorino Romano cheese…served with the Oak + Almond cocktail. The pasta was perfectly cooked to al dente, with a great earthy quality. The rabbit was delicious and soft with great flavor. The mustard added a back-note of spice, while the chestnuts complemented the other ingredients with both textural difference and a sweetness. Like the quail, the dish would have benefited from additional seasoning. 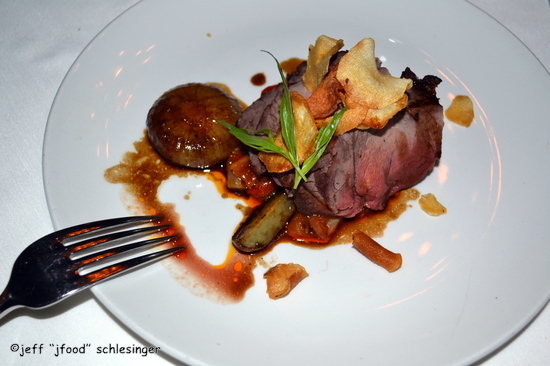 The entrée included slices of rotisserie wild boar shoulder served with duck fat potatoes, Cipollini onions over a bed of roasted peppers and topped with crispy sunchoke chips. The dish was enhanced with agro dolce and served alongside a glass of Woodsman. The meat was beautifully prepared to medium rare, offered deep flavor and was delicious. The accompaniments were outstanding with the sweet-sour balance of the Cipollini onions and peppers. This dish was perfectly seasoned and exceptional. We completed the meal with a slice of local honey pecan pie with bourbon rosemary ice cream paired with Single Barrel bourbon, a double gold winner at 2014 Denver International Spirits Competition. 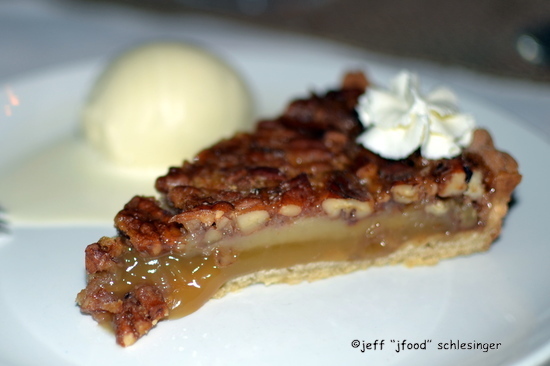 The pie was spectacular, one of the best pecan pies I have ever tasted. It started with a rich, buttery crust and the filling was sweet, creamy and wonderful. And the pecans were outstanding, delivering both a crunchiness and a wonderful flavor…everything was impeccable. The ice cream added both a creaminess and an offsetting profile with the bourbon and rosemary. Overall, the evening was filled with great conversation and food. I loved the wild boar and pecan pie. As a bourbon neophyte I was fascinated by the versatility of the spirit. From the intensity of the Single Barrel that was served with the dessert to the Oak + Almond, which reminded me of a Margarita, I was impressed by each round of the drinks. With spring on the horizon, the inviting deck at Oak + Almond is almost ready for guests to enjoy Chef Italiano’s wood oven cuisine. 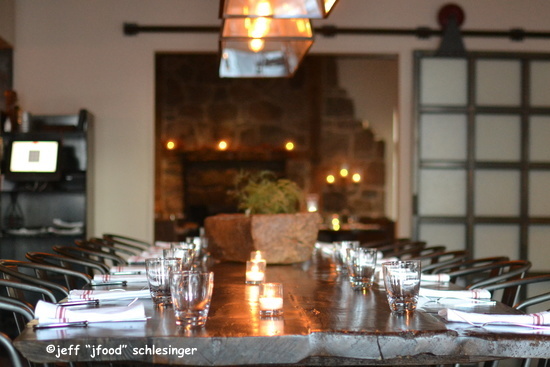 Washington Prime (SONO) 2.0 – Enter Chef Howard McCall Jr. Patrons of Washington Prime will find comfort in the cuisine of its new Executive Chef Howard McCall Jr. This unassuming chef is not new to SoNo or the kitchen at Washington Prime; he started in the kitchen at Barcelona twenty years ago and was the opening Sous Chef at Washington Prime last summer. Prior to joining Washington Prime he oversaw the kitchen at Mint restaurant in North Carolina, which influenced his new Southern style cuisine. CTbites was invited to meet the chef and sample some of his new additions to the menu. Chef Howard exudes a soft personality, allowing his culinary talents to speak. His recent changes to the new menu range from a creative American Soul Rolls to a Braised Lamb Shank, plus modifications of previous favorites. Each maintained the focus on the main ingredient with delightful accompaniments…more akin to Southern comfort food. Three of the Small Plates were delicious. The first was the Short Rib. 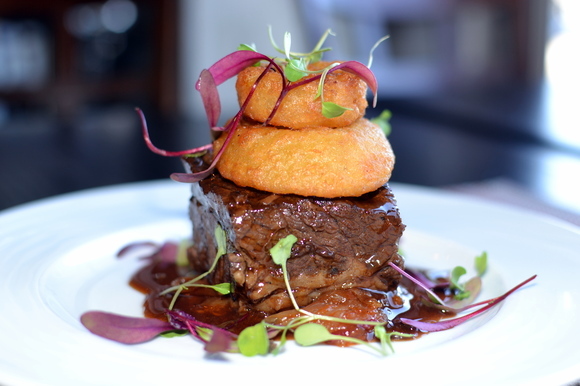 A large, single, boneless rib sat atop a dollop of the braising liquid and the chipotle onion jam, then crowned with two onion rings and finished with micro greens. The slowly braised rib was tender and succulent; and when paired with the spicy onions created a spicy-earthy combination. The onions were soft, but be prepared for a little spiciness from the onion jam, while the sauce was a wonderful and rich offset to the spicy onions. The onion rings were perfectly fried with a crispy exterior while retaining an al dente interior. Chef Howard took great care in allowing the rich flavors of the prime beef to stand out in the Steak Tartare. The dish included diced prime beef mixed with finely diced shallots, parsley and sprinkled with Parmesan cheese. It was served in a swath of truffle vinaigrette, accompanied by a quail egg. The scant inclusion of the shallots was perfect and when combined with the truffle vinaigrette was outstanding. 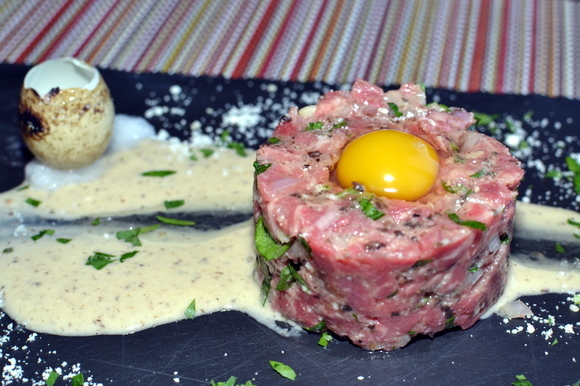 Make a divot in the beef and add the quail egg and combine to create an even richer experience. A sprinkling of Parmesan cheese added a touch of saltiness. This is one of the most delicious tartares in Fairfield County. Not to be outdone by the tartare, the Mac + Cheese is the creamiest I have tasted in quite some time. 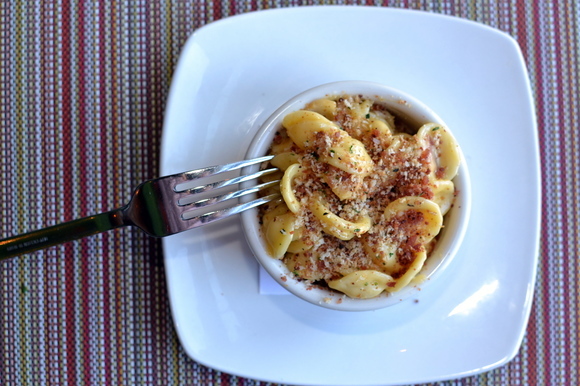 Chef Howard chose orecchiette to deliver his four cheese (White Cheddar, Yellow Cheddar, Asiago and American) mixture in each bite. This simple combination created a beautifully balanced taste. The texture was velvety and then the crunchy bacon-breadcrumbs kicked in. The pasta was cooked to a perfect al dente. There were additional bacon bits within the dish. This may be the standard for other Mac + Cheeses in the area. 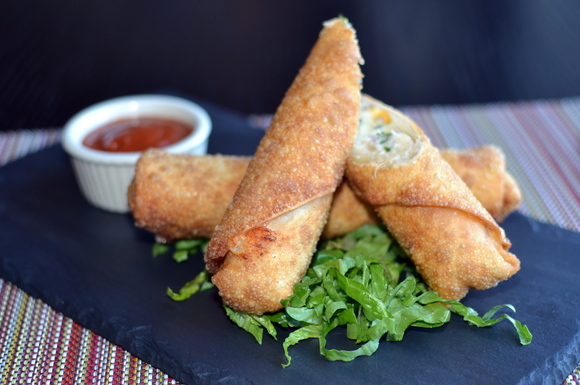 The last Small Plate I sampled was the American Soul Rolls that combined sausage, broccoli rabe, mashed potatoes served a la egg roll, with a spicy tomato-veal demi-glace dipping sauce. The potatoes were soft and creamy and were complemented by the crispy egg roll skins and a tomato dipping sauce worked well with a crispy potato combination. The spiciness of the sausage was balanced by the smoothness of the potatoes. I could probably enjoy the Soul Rolls accompanied by a beer at the bar but thought there were too many elements competing in the dish. 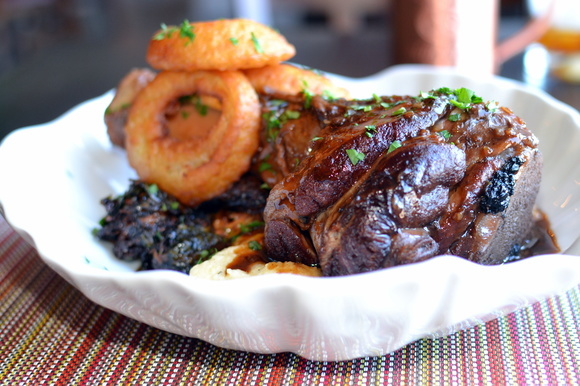 I also sampled two of the large plates and really enjoyed the Braised Lamb Shank. It was served nestled in polenta, crispy Brussels sprouts and topped with rich gravy and a few onion rings. The large shank was perfectly braised to maximize its tenderness and the Brussels sprouts were fantastic, crispy and sweet. The polenta was creamy and mild…a great canvas for the all of the rich flavors of the dish. And lastly, a few perfectly fried onion rings perched on top to accompany an already great presentation. 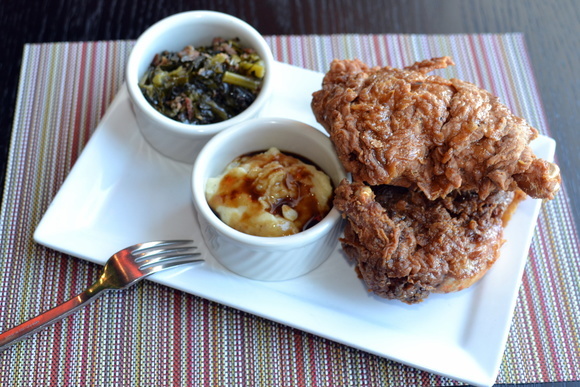 The SONO Fried Chicken was an enormous half chicken served with its traditional accompaniments, mashed potato and gravy, plus braised greens. I started with the sides…they were fantastic. The potatoes were creamy, lightly seasoned and the gravy was excellent. The braised greens were outstanding with a sweet syrup and bacon. The two enormous pieces of chicken were disappointing. The ultra-crispy fell off the chicken and cutting the chicken was incredibly difficult. The texture of both the breast and the thigh was too firm for my taste and the entire chicken was under-seasoned. As much as I loved the sides, the chicken was not to my liking. 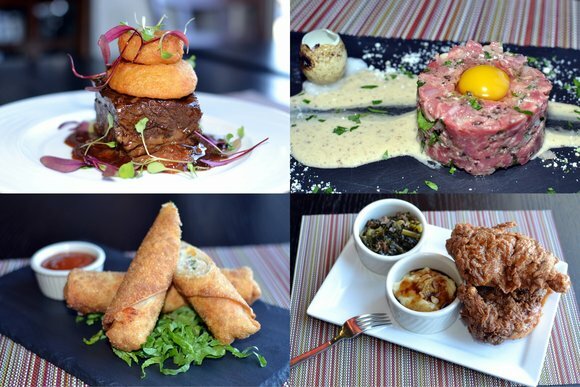 Chef Howard’s cuisine is Southern comfort with a modern twist. He has a delicate touch that allows the main ingredient to maintain the focus of the dish with accompaniments that enhance the flavors. I look forward to returning to Washington Prime and enjoy many more of Chef Howard’s new creations on the menu. In the midst of a 10-course dinner with friends at Spread I ordered the “Cheeseburger.” I’ve enjoyed Executive Chef Carlos Baez’s version in the past and wanted to see if there was any update to his interpretation to one of my favorite dishes. Chef Carlos starts his rendition with an 8-ounce patty of grass fed Kobe beef. He tops the patty with pickles, melted Cheddar cheese with the option of bacon or Jalapeño peppers, with a swath of spicy mayo encased in a sesame seed bun. Since spicy mayo was already included I asked for the bacon but not the peppers. The meat was outstanding. It was cooked perfectly to my requested medium-rare, and the kitchen was delicate when they formed the patty, it maintained a wonderful loose grind. The flavor was deep and rich from the grass feeding and was juicy, but not overwhelming. The bread and butter pickles added a great sour component and the bacon was perfectly cooked and a smoky-salty balance. The spicy mayo was a little too spicy for me, detracting from the other great flavors, but that is a personal preference. The bun added a nice buttery complement. The fries were excellent, fresh, hand cut with just a touch of salt. 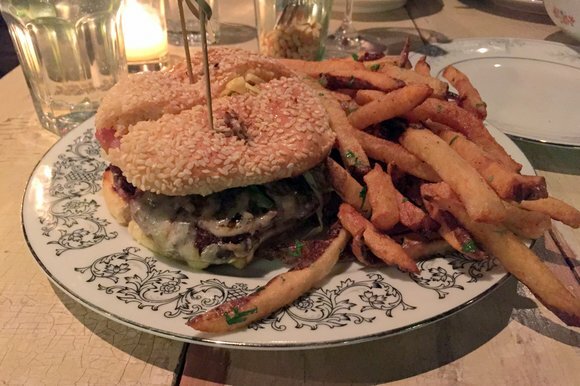 Chef Carlos is hitting it out of the park with his cuisine and the burger was just one great example.